The haul puts Castro in the back of the pack among 2020 contenders who have chosen to reveal their first-quarter fundraising figures ahead of a Monday deadline to report them to the Federal Election Commission. But his campaign says it is exceeding its expectations and has seen a recent acceleration in fundraising that has brought its total raised for the race to $2 million. "We surpassed [our] goals for this quarter, and we're exactly where we want to be right now," Castro campaign manager Maya Rupert said in a statement to the Tribune. "Sec. Castro knows he's not a frontrunner now, but he sees the results of his effort every day. We're confident that when voting starts in 2020, he'll be a frontrunner then." Castro's campaign said he will report raising $1.1 million, spending $625,000 and having $678,000 cash on hand at the end of the first quarter. That came after he raised $220,000 through his exploratory committee during roughly the second half of December. 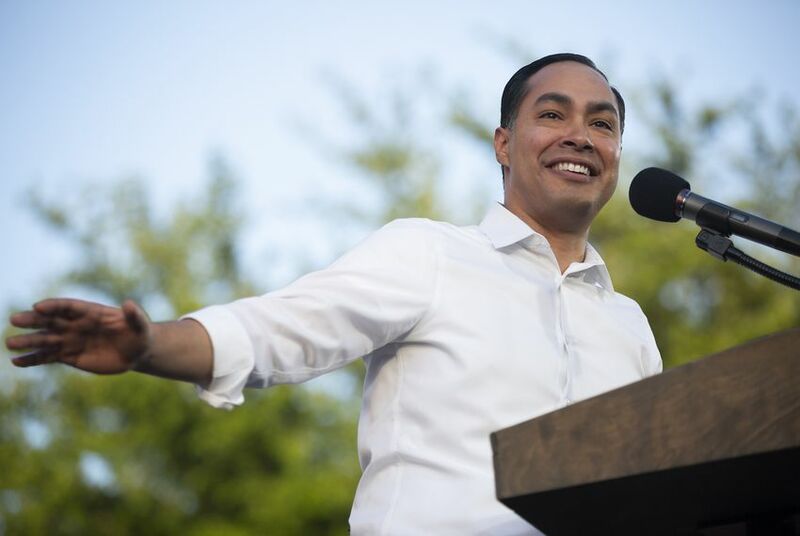 Castro, the former U.S. housing secretary and San Antonio mayor, was among the first major Democrats to formally move toward a presidential run, creating an exploratory committee Dec. 12 and launching his campaign a month later. He has remained low in the polls but has seen a recent uptick in media attention after releasing his immigration plan earlier this month, holding a counter-rally in San Antonio after President Donald Trump visited Wednesday and doing a CNN town hall the next day. Still, Castro's fundraising numbers place him far behind other candidates who have announced their first-quarter figures, including those who entered the race later. Among them is fellow Texan Beto O'Rourke, whose campaign said it raked in $9.4 million between his launch March 14 and the end of that month. One candidate who started closer to Castro, U.S. Sen. Elizabeth Warren of Massachusetts, raised $6 million during the first three months of the year, according to her campaign. Castro's campaign said its average contribution to date has been $32 and that it has had 50,000 donors. Thirty thousand of those donations have come in the first two weeks of April. Castro's campaign says it is confident he'll hit the donor threshold in time given his recent fundraising momentum. In addition to Ager, who was named the campaign's senior adviser for digital, Castro has made a number of recent hires. Also last month, the campaign brought on board Mili Gosar as director of voting and delegate strategy. She previously was national voter protection director for the Democratic Senatorial Campaign Committee. Two more key staffers are joining the campaign early next month: Lillie Catlin as national organizing director and Christina Cue as South Carolina state director. Catlin currently serves as the deputy organizing director at the American Civil Liberties Union; Cue worked under Castro when he was housing secretary.